Remember I told you that I had a crazy and WILD story that involved my dad, an elk, a bear, and a suburban? Well, I'm finally gonna tell it to you. Wait till you hear this. I wish I had pictures to prove that it happened, but I guess my mom just sat by watching all of it not even THINKING of taking pictures. Oh well. It happened anyway. And here's how it went. First of all, since most of you have never seen OR met my dad, I think I owe you a description of him. Does this picture give you an idea of him at all? Yeah, he's one BIG ol' tough Montana guy. He's hiked these mountains all of his life. And he still is hiking them! Cool thing about that is that he JUST turned 66. Impressive isn't it? This is a picture of him snowshoeing up one of the peaks behind my house. 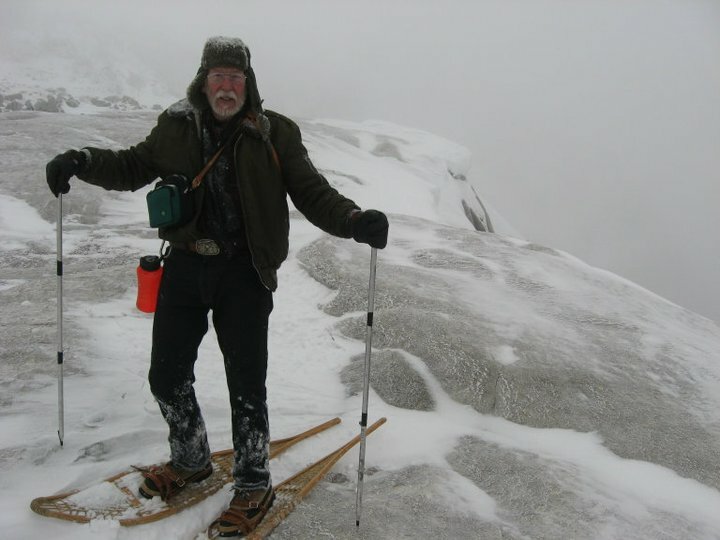 It's near the top of a 9,000 ft peak and he hiked all of the way up on his snowshoes! I've hiked that hike in the summer and it is a tough hike. But winter, nope, I haven't braved that one yet. Don't think I ever will. But Dad can't even count the times he's done it on snowshoes. Dad is also a logger (has been ever since he was young) and if you don't know anything about loggers, they cut down trees for a living and that is a pretty tough job. (A lot of people refer to them as lumberjacks.) Logging requires A LOT of walking and lifting that makes a body pretty strong. Ok, so back to my story. Or HIS story as he told it to me. (Now that you know him a little bit, I think you just MIGHT think about believing his story.) haha The other day Dad and Mom decided to check out the flooding around there (it's CRAZY right now), so they took a drive up to the ghost town that is behind our house. Their house is in the valley and the town of Elkhorn is up in the mountains, so it takes awhile to get up there. About half of the way there, they decided to stop and take some pictures of one of the creeks that is flooding. As they were taking the pics, a suburban drove by and passed them. Not too long after they too decided to keep driving. Not too far up the road they came upon the suburban again, but this time the suburban was stopped on the side of the road. (Often in MT when another car is stopped, you might want to take notice just in case they are watching some wildlife on the side of the road!) As Dad and Mom came on the scene they also heard a terrifying SCREAM coming from really close by! And there in the meadow they saw it. A small black bear catching a baby elk!! The baby elk was the one screaming because the bear was catching him. This is where the story gets exciting! My Dad, being the tough ol' guy that he is, immediately JUMPED out of the car, RAN down towards the bear, and started screaming at him to let go of the baby elk!! Yeah I couldn't believe it either. I guess my Mom (understandingly) was telling him NOT to go, but he took no notice of her. As my Dad was yelling at the bear, the bear dropped the baby elk and RAN away into the trees!! (When I asked Dad what happened to the bear, he just said, "Oh I don't know, I was just concerned about the baby elk!") Imagine getting a bear to run away from you. WOW! I would have LOVED to see it. And that isn't the end of the story! As soon as the bear dropped the baby elk, it RAN over to Dad. (The Mom elk has been watching all along from in the trees). Then it got scared and immediately jumped right into the raging stream!! And Dad takes off running after it! (I told you it gets better) The water was so crazy that it held the baby elk's head under water so it was just bobbing along helplessly and floating downstream. POOR baby!! But Dad didn't give up! He kept running after the baby elk as it floated downstream and tried to get a hold of it. FINALLY, after struggling for awhile to reach it, he happened to grab one of its ears and got its head above water. Eventually he dragged it onto a rock to safety, which made it scream again. (My Dad said it was VERY heavy even though it was a baby. He was very thankful he was actually able to pull it to safety.) Then it jumped up, ran across the road, and was reunited with its mom. Dad said his lungs even hurt after all of that!! Wonder why that would be? LOL And now you know why I said you wouldn't believe it. Great story huh? I think it deserves to be in the movies or something don't ya think? I guess the people in the suburban watched the whole thing happen. There was even a little boy along and my Dad said he got SO excited!! LOVE my Dad. There's NO one quite like him. And yes, this would have made a GREAT Father's Day post, but being the LATE person that I am, it just had to wait. Hope you enjoyed hearing it as much as I enjoyed writing it!! :) I'll have to admit, there ARE some pretty wild stories coming out of Montana. But that's just how Montana is. Wild and absolutely beautiful!! Oh and before you go, my Sweet Little Photo Swap is still going on and you can still write and enter your picture post!! Would LOVE to have you join!